Xperio is a new brand of polarized lenses that brings the very best industry-leading designs in polarized sunglass lenses. Xperio polarized lenses offer superior visual performance and optimal comfort in the widest range of polarized lenses available. In fact, Xperio offers many unique polarized lens design and material combinations. Every year 3.2 million people go blind from prolonged UV exposure! Every patient is at risk of vision damage because of harmful UV rays. Xperio Polarized lenses completely block UV rays, providing 100% UVA/UVB protection, reducing potential Vision damage and help eliminate dangerous glare-even dashboard glare for greater driving safety. Xperio lenses let you see even the smallest things with greater clarity, truer color perception, and total comfort, so you can enjoy the beauty of the outdoors like never before, so make Xperio lenses your next choice on RX sunglasses. Light is emitted in waves by the sun, or by artificial sources like a bulb. These waves vibrate and travel in all directions from the source. When light encounters an object, it can reflect and enter the eyes. This light is focused onto the retina and sent to the brain where vision occurs. Often, light reflects back to our eyes from shiny surfaces such as roads or buildings, car hoods, sand, and water. When this happens, the reflected light waves now travel in a single horizontal plane and with high intensity. This "flattened" light is known as "polarized light". When light bounces off a shiny surface, it can become polarized and enter the eye causing blinding glare. There’s more to sunglasses than looking cool! Unlike regular sunglasses, Xperio Polarized lenses virtually eliminate glare, allowing you to see more clearly and comfortably outdoors. 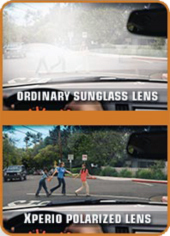 Xperio lenses eliminate dangerous glare - even dashboard glare - for greater driving safety. A recent clinical study measured driver reaction times for Xperio polarized lenses versus ordinary tints and found that driver reaction times were improved by 1/3 of a second. For a car traveling 50 mph, 1/3 of a second allows a driver to stop a vehicle 23 feet sooner. That’s the length of an intersection and could mean the difference between being in an accident or avoiding one. Xperio lenses let you see even the smallest things with greater clarity, truer color perception and total comfort. Clinical studies show that Xperio polarized lenses improve contrast sensitivity by 75%, allowing you to experience the outdoors with increased clarity of vision versus ordinary tints. This enables Xperio lenses to allow you to see truer color outdoors.